Make no mistake about it: despite attempts by some to downplay the significance of the biggest leak of secret documents in the history of the Middle East conflict, the Palestine Papers are explosive. Their content will not surprise those who have been paying attention. Nonetheless, as Ali Abunimah explained on Al Jazeera, there is a difference between thinking you know something and having it confirmed in official documents. The major revelation thus far is the Palestinian Authority’s offer, in 2008, to give Israel “the biggest Yerushalayim in Jewish history”, permitting it to formally annex nearly all of East Jerusalem. Alongside this the Palestinian negotiating team outlined a deal in which Israel would annex 1.9% of the West Bank in the context of a landswap, permitting Israeli to incorporate into its future borders 63% of the illegal settler population. The response from Tzipi Livni, now the leader of Israel’s ‘moderate’ opposition, was blunt: “we do not like this suggestion because it does not meet our demands”. The leaked documents also shed light on the much vaunted Olmert ‘peace offer’ of 2008. We already knew that there was nothing ‘peaceful’ about it, both from previous leaked documents and from Olmert’s record of massacre and settlement expansion, but the latest documents add important details. “Israel takes more land [so] that the Palestinian state will be impossible … [T]he Israel policy is to take more and more land day after day and that at the end of the day we’ll say that is impossible, we already have the land and we cannot create the state”. Later this week we will read how Israeli leaders “asked for some Arab citizens to be transferred to a new Palestinian state”. Today that position is conventionally associated, particularly by ‘liberal Zionists’ keen to whitewash the Israeli mainstream, with Avigdor Lieberman, who despite his position as Israeli Foreign Minister is often portrayed as an ‘extremist’ and located on the far-right fringe. But as these leaked documents show, Lieberman is a late-comer. Most of the Arab world’s anger so far has been directed not at the Israeli government but at the PA. This makes sense: Arabs take Israeli rejectionism for granted. Unlike many liberals in Europe and America, they cannot afford the luxury of delusions about our ally’s role in the region. The PA’s collaboration has also long been clear, but the extent of the betrayal revealed in the documents is nauseating. They record Abbas greeting Condoleeza “birth pangs” Rice with, “[y]ou bring back life to the region when you come.” “I would vote for you”, senior negotiator Ahmed Qureia told Livni; Ariel Sharon was my “friend”, Abbas enthused. We already knew about the PA’s collaboration with the US and Israel to overthrow Hamas; its support for the Gaza siege; its close cooperation with the Israeli military; and its diplomatic manoeuvres to bury the UN inquiry into the 2008-9 Gaza massacre. These new leaks promise to reveal how PA “leaders were privately tipped off” in advance about the Gaza massacre – something previous leaks have already confirmed. Again, none of this should come as a surprise. The PA is a product of the Oslo process, which was designed, as former Israeli foreign minister Shlomo Ben-Ami put it, to groom a Palestinian leadership class to act as “Israel’s collaborator in the task of stifling the [first] intifada and… [cut] short what was clearly an authentically democratic struggle for Palestinian independence”. The aim, another Israeli minister explained, “was to find a strong dictator to ... keep the Palestinians under control.” The PA is “almost wholly dependent upon American, European and Arab political and financial support, as well as security and economic cooperation with Israel” and so can only operate within limits dictated by Israel and its international backers. This was dramatically illustrated when Palestinians elected a government that didn’t enjoy the backing of their occupiers in 2006. The US, Europe and Israel responded by starving it of funds, isolating it diplomatically, kidnapping a third of the cabinet, killing hundreds of Palestinians, destroying Gaza’s only power station, and training and arming Fatah militias to overthrow it. 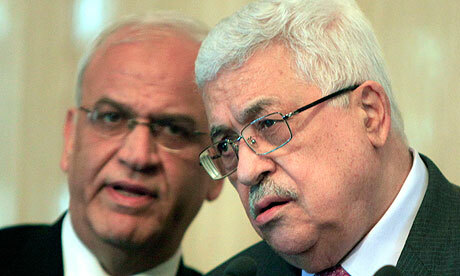 It is a mistake, then, to focus overly on the corruption and venality of Abbas, Erekat, et al. The more important point is that the PA is structurally incapable of serving as an instrument of Palestinian liberation. Our takeaway lesson from the documents should be the need to end our government’s support for Israel’s occupation and Abbas’s quasi-police state in the West Bank. It is still too early to predict how reaction to the leaks will play out. The PA is denying everything on the grounds that, paraphrasing Erekat, ‘we can’t have offered Israel virtually all of East Jerusalem, because if we had then obviously Israel would have accepted it’. What is the Arabic for ‘facepalm’? “We don’t hide anything from our brothers”, Abbas insisted as the PA threatened to shut down Al Jazeera. Abbas has accused Al Jazeera of declaring “war” on the Palestinians – Erekat is presumably drawing up an agreement to cede East Jerusalem to Riz Khan. The popular legitimacy of the PA, already damaged, is surely now destroyed. In the long-term – possibly sooner - this could spell its demise. Certainly Palestinians will not achieve their liberation under its auspices. Many commentators have interpreted the leaked documents as representing the death of the “peace process”. In fact what the papers reveal is that what newspapers, echoing U.S./Israeli propaganda, continue to call a ‘peace process’ was from its inception “the most spectacular deception in modern diplomatic history”. Others see in them the death knell for the two-state settlement. Again, it is difficult to see how this conclusion follows. The papers reveal U.S./Israeli rejectionism – as expected. It doesn’t follow from this that said rejectionism is irreversible. It is entirely possible that, should the U.S. and the EU, under domestic pressure, re-join the international consensus and apply serious leverage on Israel to do likewise, the latter will be forced to comply. At any rate, if the two-state settlement wasn’t already dead, then there is no reason to suppose that these papers are the final blow. Continued failure on the part of Europeans and Americans to pressure our governments to end their support for the occupation, on the other hand, might just be. Until they are proven to be real and unaltered, spending a lot of time on them is pointless; that said, IF they are real the most startling thing seems to be that Israel will take nothing less than 'unconditional surrender' terms - no negotiations that in any way give the Palestinians anything. Quelle surprise, eh?